If there is one vegetable that you are almost always bound to stock in the kitchen, it is the humble potato. An ingredient used extensively in the Indian kitchen, it is not just versatile as a vegetable, but also as a beauty treatment. There are many ways in which you can use potatoes to treat skin and hair problems. Grate a small potato after peeling it. Cleanse your face well. Apply the potato gratings on your face and rub them well into the skin. Leave it on the skin for about fifteen minutes before you wash it off. You will see that with prolonged use, potato helps in reducing any uneven skin tone that you have. Potato is rich in vitamin B-complex and vitamin C and also in minerals such as zinc and magnesium. Together, they help restore the collagen and elastin in the skin. So a potato face mask will help restore the suppleness of your skin. The vitamin C in the potato and its alkaline nature help in healing blemishes and warding off skin infections. In order to treat blemishes, place a small potato in the fridge. After it is cold, simply extract some juice out of it and dot it on your blemishes. Leave it to dry. Do this on alternate days and it will help fade away blemishes and dry out any acne. If you have dark circles, then it is a sign that you are not getting enough rest. To lighten the dark circles, Grate some potato and place it under the eyes and leave it for fifteen minutes while you get some shut eye. Wash it off. Repeat frequently for best results. Potatoes have emollient properties. 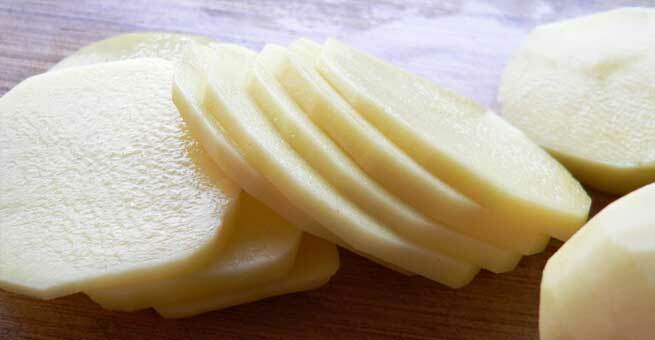 So the next time your skin is irritated and turns reddish, cut a slice of potato and gently rub it on the skin. This will relieve you of any inflammation in the skin. This property of potatoes also makes it a great after sun treatment in case you have sun burns. The alkaline nature of potato makes it effective in sloughing off dead cells. Either use a slice of potato or simply take out the inner part of the potato skin and scrub your damp skin with it. Add a once in a week exfoliation with potato skin to your routine for softer and smoother skin. Mix equal parts of cucumber and potato juice and apply it on the skin with a cotton ball. Leave it to dry before you wash it off. The starch and the catecholase enzyme in potato, together with the ascorbic acid in cucumber help in lightening the skin tone. Equal parts of potato and cucumber juice mixed with a pinch of baking soda can be used as a face cleanser. You can simply splash your face with this mixture and use the baking soda granules to work on removing any blackheads or dirt. Once you have used up the potato for cooking, boil its cleaned peel with some water and use the water to rinse your hair. This will help you in cutting back premature greying of the hair. Potato also promotes hair growth. Hence it makes for an excellent addition to a hair mask. The starch in it helps add volume to your hair. Juice one potato. Add an egg yolk to it. Beat well. Add a tsp of honey to this mixture to make it fragrant and also to moisturize the hair. The protein in the eggs helps strengthen the hair. Apply this mask on the hair and leave it to dry for half hour. Shampoo as usual after that. Do it twice a month for best results.